Big Country Outfitters: Does BCO have big bear? Does BCO have big bear? I have been asked that very question quite a few times........."well would like to hunt with you guys, but do you hunt big bears?" I answer "does a bear doo - doo in the bush?" 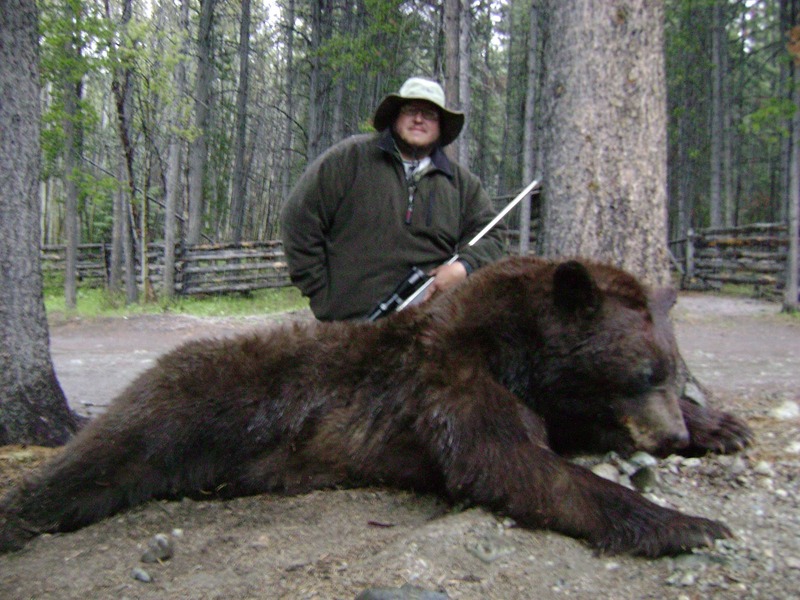 BCO has some of the best bear hunting opps in British Columbia. Stop and think about it, currently BC's black bear population is at an all time high, with populations reaching 160,000. On top of that, human-bear conflicts have almost doubled since the early 90's. Clear cut logging produces some of the greatest bear habitat, and with the recent devastation of the Mountain Pine Bettle infestaion and the forced harvesting of large forested areas.....the bear population will take another jump. Add to all that the fact that the governement now wants many secondary logging roads laid to rest and reclaimed........"BOOM"......we are getting to have prime bear habitat literially around evey corner. I was looking for a great bear area when I came across this one a few years back, and it has not dissapointed me in at any level. I have made a sudy of bears and bear hunting and this area is a real "furry" jewel. Each season we encounter dozens upon dozens of bears; some with size, some with color, and some with both. I feel our rate of color bears is up above 40%, and our color variations can range from near blond, to rusty red, to rich chocolate. The Island bears may have a few more pumpkin heads then we do (although we have had bears almost go 21 inches), but those bears lack the surprise of color variation. As for the size factor.....we take 7 foot plus bear each and every season. In fact last year we had a young client take a 7 foot 3 giant at 7 yards while in the kneeling position.......eye to eye. Another client had all but given up on Canada for bear hunting, he decided to give us a chance to turn his bad luck (and bad outfit/guiding experiences) around and we did so in typical BCO fashion. The message remains the same, we deliver some of the best bear hunting around. If you have ever considered BC for a bear hunting adventue, consider BCO......I strongly feel that we should be on most any sportsman's/sportswoman's bucket list, we are truly a one-of-a-kind outfit. I am my wonderful wife's husband. A father to my great kids. I'm a cowboy and a rancher. I'm a outfitter and a guide. I'm a farrier and a bit of a horse trainer.I'm not rich but have a damn good life. I'm typically quiet but opinionated and sometimes share. I'm a good friend and neighbor. I love to laugh and make others laugh. I care sometimes too much. Welcome to Big Country Outfitters! Big Country Outfitters. Picture Window theme. Theme images by sndrk. Powered by Blogger.